With a lifelong interest and experience in drawing, painting and multimedia, Ilene Richardson has worked as a glass artist since 1981. The magic of colorful light shining through glass continues to be her focus in both glass beads and stained glass windows. The complete collection of Ilene's artwork is testament to her grasp of structure, composition and rhythm. Her pieces are built from gestural impressions and layered energetic surfaces. Ilene's palette whether in paints or glass, reflects the immediate feeling of light, color and luminosity. Her work is equally energetic, yet sensitive, combining colors, texture and form through potent color theory. After graduating from The Maryland Institute, College of Art in Baltimore, Maryland, she located her art studio years ago, to the Eastern Shore of Maryland. Her painting, stained glass windows and glass beads can be found throughout the United States. As a self-representing artist, Ilene maintains this website and BLOG, in addition to working part-time as a Licensed Professional Counselor in private practice. She often works late into the wee hours of the morning on her laptop, devoted to the many endeavors she creates. Traditionally taught at The Maryland Institute College of Art focusing on drawing, painting and printmaking, it wasn't until a few years later the exploration into the art of stained glass began 1981. Further art training continued years later at Eastern Virginia Medical School in Norfolk, with a Masters degree in Art Therapy. 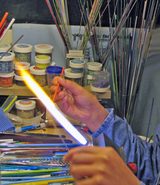 The experience of working with stained glass became the foundation which led the journey into hot glass beads numerous years ago. Earlier concentration in drawing and painting shifted to incorporate the myriad of colors and textures in glass that now contributes to all of the art work. My approach to working in glass, whether it is stained glass or handmade glass beads, is with the eye of a painter, appreciating tonal qualities and seeking the precise combination of colors in the glass. The process of working in the flame is what I love. 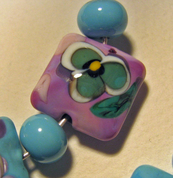 Each bead created teaches me even more about color, form and the magical nature of working in glass. Each color of the bead is chosen for the elegant quality of shadow and light that glows from within the glass. These elements gather in unison, fulfilling my artistic need to create depth, movement and emotion through glass. Working with fire and glass has developed new ambitions for me as an artist. Along with painting in watercolors and pastels, the process of making beads in the torch’s flame is what I am in love with. The technique of taking rods of glass into the long flame of a torch to make beads is now second nature to me. Handling molten glass while teasing it into balance around a steel mandrel, letting temperature, surface tension and gravity influence the end result, fascinates me every time I sit at my torch. The more time I spend making hand torched beads, the more the flame teaches me about glass and color. Time passes by unnoticed, as hours of creativity are spent working in the flame. All of my handmade torched beads are combined into jewelry using a combination of various Swarovski crystals, semi-precious gemstones, sterling silver and Bali silver beads, and occasionally antique hand carved accent beads. Necklaces, bracelets and earrings are available in endless combination of colors and designs. All of my beads are kiln-annealed for many hours, which is critical to allow the molecules in the beads to line up, decreasing internal stress in the glass and providing structural integrity.